In case you missed Apple’s announcement, whether it was out of anger or lack of interest, there were a few moments that made me giggle. When Phil Schiller took the stage, he continued the trademarked Apple presentation of slide after slide of propaganda information. 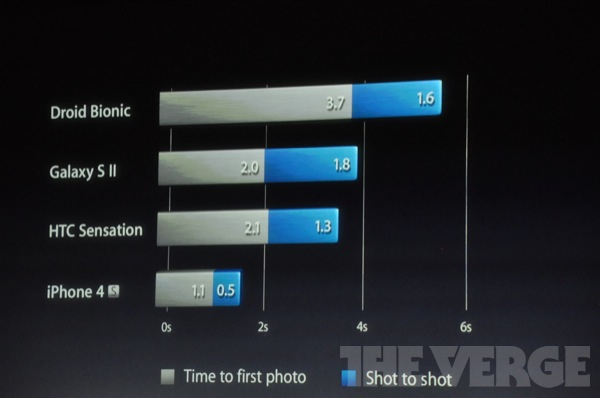 When the slide pictured above came up, Mr. Schiller was quick to taunt the competition, mainly the Droid Bionic. I have to admit, I laughed. Let’s be honest, Motorola doesn’t have the best cameras, no matter how many megapixels they pump into them.